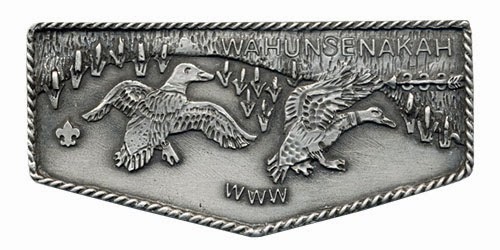 In May of 2013 Wahunsenakah Lodge issued two metal flaps, each manufactured by The Witch Trail Committee of Mansfield MA, who also produced the first lodge belt buckle. Like the buckle, the metal flaps featured the design of the S2 service flap. Upon receipt of the finished flaps the lodge noticed that the manufacturer inadvertently left out the fleur-de-lis. Rather than return the flaps they were sold and a corrected version ordered. The new versions complete with FDL in each design were recently released. Like the first versions, there is a pewter version (the 333 M4) and a gold wash finish version (333 M5). Both can be purchased by any member of the Lodge, but the gold version is restricted to wear by youth members of the Lodge Executive Committee. Bayport Scout Reservation in Jamaica, VA was the site of the Wahunsenakah Lodge 333 Fall Fellowship on October 25-27. 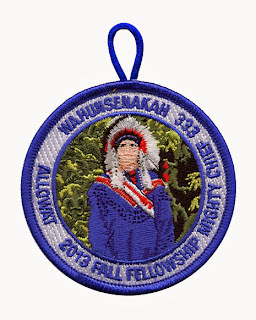 Following the theme of other activity patches issued by the lodge this year, the patch for the event features a Scout in the ceremonial dress of Allowat Sakima, the Mighty Chief. Eleven new Vigil Honor members of the Lodge were recognized at the Fall Fellowship. On November 9, 2013 Newport News Shipbuilding will christen the Navy's newest aircraft carrier. The Gerald R. Ford (CVN 78) is the first of a new class of aircraft carriers, and has been under construction since 2005. It is named for the 38th President of the United States who was an Eagle Scout as a youth and served on the aircraft carrier Monterey in the Pacific Theater during WWII. In honor of the event a special Colonial Virginia Council shoulder patch has been commissioned by the Shipyard. Pictured above, the patch has a gray border and features the carrier and the Eagle rank emblem. Thanks to Larry Johnson for the scan of the patch.